I think I always say the same thing when I put a new CBM on here so I'll do it again in order not to disappoint you. Another day, another CBM. Actually Sendai has been open a while, but it's obviously a little more tricky to get to for me than the ones in Tokyo. There's probably not a great deal of original things to say about it as these places are very similar in many ways, branch to branch. As usual, I recommend checking the other posts on CBMs to get an idea. I'll go into brief details below about what you need to know though. It has the usual 30 taps of cheap beer in the usual sizes at the usual prices. Most beers are served in two sizes 250ml (¥480) and 473ml (¥780). Barley Wines and stronger beers come in smaller serving sizes at the lower of the two prices. There is a ¥300 cover charge but this is easily covered if you have a few drinks as the prices are pretty cheap. Taplists for all the branches are updated daily on the CBM website. Has the usual CBM decor, lots of wood and stone, and at 10pm on a Saturday night it seemed to be very popular, so get there early or make a booking. [This was pretty much cut and pasted from my last CBM entry]. 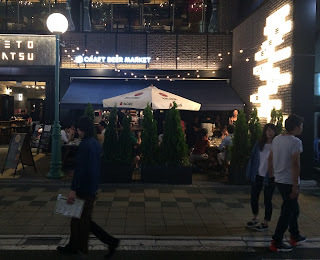 - Sendai's food concept is seafood. The place smells a little of seafood unsurprisingly. - They have a nice patio out front and it seemed a little bigger than other CBMs (although their tabelog says only 43 seats). - It's open late. Closing time varies but the earliest it closes is 01:00 and the latest 03:00. Also seemed a little more lively than other branches. Not sure if this is because it was late, because it was the weekend or because it was Sendai. Or a combination of these. Party on!